Dorset County Council (DCC) are faced with a challenge. The population of Dorset is ageing rapidly, and there are significant changes planned for the future funding of adult social care. DCC approached CuCo in their search for an agency who could plan, create and execute an all-new advertising campaign on their behalf. We were tasked with communicating the planned changes to the community of Dorset, raising awareness of the issues faced, and inspiring action. Ultimately, DCC want people aged 30+ years to be made aware of the huge cost of care in Dorset, and encourage them to make provisions for themselves in later life, rather than relying on the local authority. The main goal and desired outcome of the Adult Social Care Campaign is that when residents approach DCC regarding adult social care they are better prepared, both financially and strategically. To provide us with a greater understanding of the requirements for the Adult Social Care Campaign, CuCo undertook extensive research into the demographics of Dorset. It became apparent from our research that DCC has a large population of 65+ year olds and that this number is ever-increasing. Both this increase and an above national average life expectancy means that there is a greater need for Adult Social Care. We also found loneliness and social isolation to be alarmingly high and combined with health condition problems, this group of people become very vulnerable. We need to get people thinking now – no matter what age group they fall under. 30 to 49 year olds need to start thinking about their own futures whilst also thinking about older family members now. 50 to 59 year olds need to understand and become aware of their own health behaviours and the impact of these on both their physical and mental health, and 60+ year olds need to take action now. To achieve these set goals, our campaign needed to educate our audience about the changing landscape of Adult Social Care and encourage residents to make provisions for their own or their loved one’s future care needs. We therefore planned, created and executed a six month marketing campaign across both a digital roll-out and an offline campaign. This included developing a strong creative to be communicated across web banners, social media visuals, roller banners, post cards, flyers, and magnetic livery for company vehicles. Our creative team got straight to work with brainstorming ideas for the branding of the campaign, considering campaign messages, as well as various creative concepts which would successfully portray these three key messages. The strapline we settled on is a direct call to action. 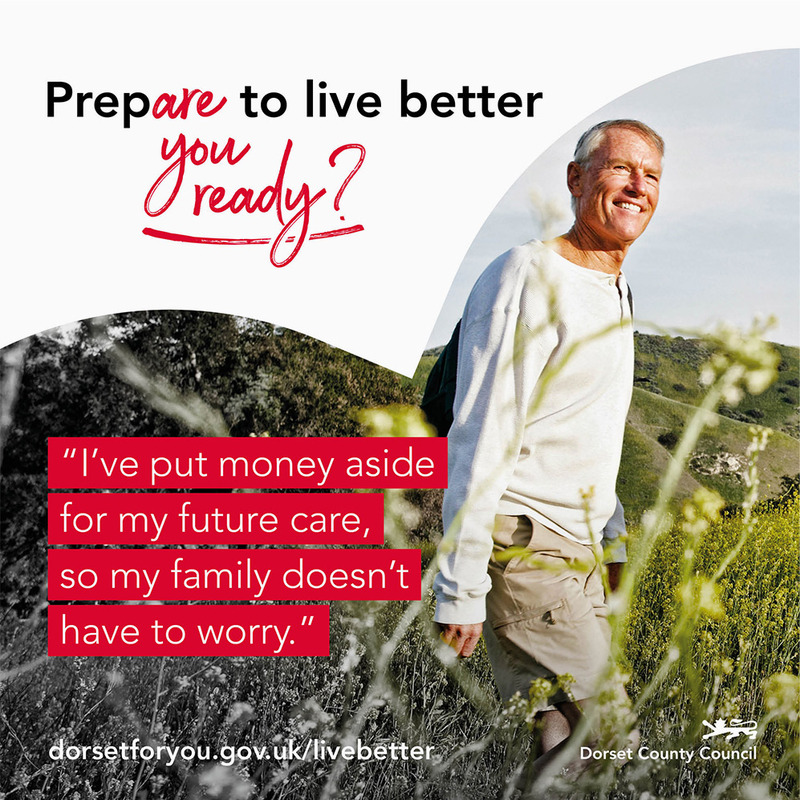 It suggests to Dorset residents that if they start to prepare now for later life, they are likely to experience an improved lifestyle when they are less able. We wanted residents to think in advance and the ‘are you ready?’ additional mechanism inspires residents to consider their existing plans for their care, and spurs those who may not have a plan yet to start taking a more proactive approach to the future needs of either themselves or a loved one. This was also front of mind when considering the colour palette of the campaign. We chose two colours which we felt most effectively represented both target audiences in this campaign. The orange represents the here and now, and those who are in immediate need of Adult Social Care, signifying optimism, confidence and having courage. The colour red represents preparation for the future, and those who need to not only prepare themselves for later life, but also take care of their elderly loved ones. The red signifies strength, desire, energy, warmth and love. Throughout our campaign lifestyle photography we used a combination of mono and colour – with colour pulling out the key individual or object, “Prepare to live better” adopting the mono space and the secondary line of “are you ready?” and “live the good life!” adopting the colour space. When considering the imagery used throughout the campaign, we wanted all photography to have a visual impact of: staying active, powerful identities i.e. strong women, self-care, the Dorset countryside, and arts & culture. 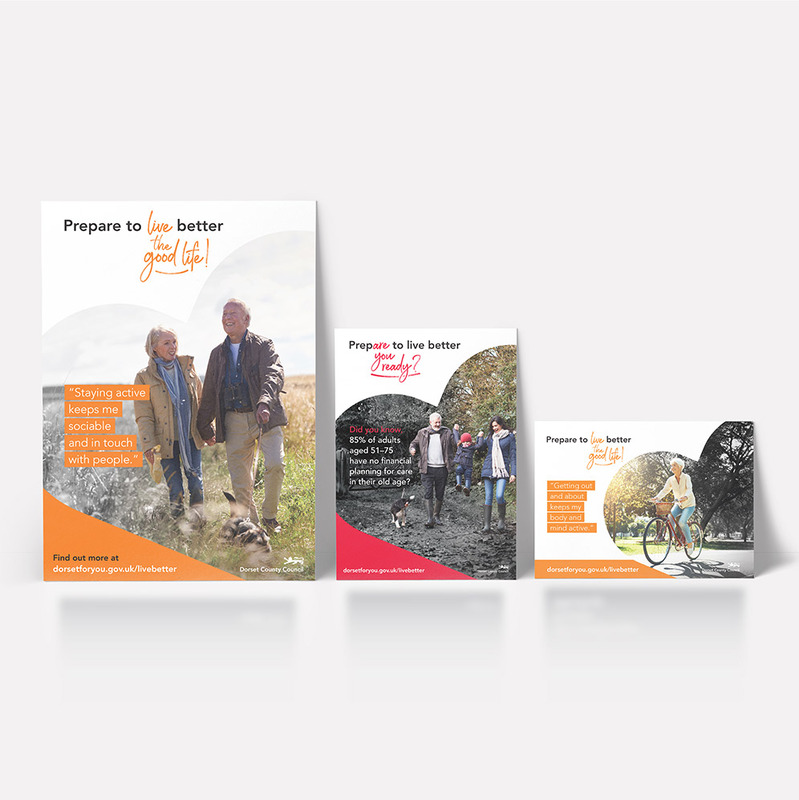 We chose these themes in order to make the campaign relatable to the local target audience, and the use of colour around the key individual or object highlights the key messages of preparing for the future and living life to its best! The heart mechanism utilised throughout the brand symbolises the key message of the campaign: We all need to care and look out for one another in order to live a long and happy life. The Adult Social Care Campaign will encourage the community of Dorset to consider: Do you have someone to help? The campaign works on two levels, not only does it encourage those who might not require support to be proactive, information-seeking and forward-thinking about putting into place a plan of action for maintaining their independence, it also encourages a sense of community spirit among friends and family of an elderly or disabled person living in Dorset, reminding them of their responsibility to help. The campaign is bright, bold, demands attention and will drive people into action! It will help to rally the community together, break the stigma surrounding Adult Social Care and encourage the population to reach out to and interact with others to ensure people live a happier, longer, healthier life, both in Dorset and beyond!